Height: 168 cm (5' 6") The main character of the story. As the youngest son of a soldier, Kazuya has spent most of his life struggling with living in his highly successful siblings' shadows. Jealous of all the attention his brothers got, he worked hard to compete, but everything changed when he understood that adults, who think that the youngest child is always spoiled and useless, will never acknowledge his efforts. With a permanent scar in his heart he left the military academy in Japan and before anyone from his family could stop him, went to study abroad to St. Marguerite. Unfortunately, his appearance, combined with the student body's belief that "the traveler who comes in the spring brings death with him" has resulted in Kazuya being called the "Reaper" and having no friends. 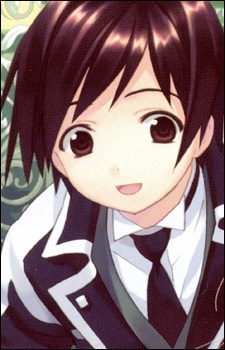 By some twist of fate he becomes a messenger and companion to the most eccentric pupil in the school, Victorique. At first he didn't like Victorique because of her arrogant attitude, but after some time he started to care for her and be protective of her. He is described, by Victorique, as a good and sincere person whose soul is pure and beautiful enough to admit pride. Despite everything that happened in Japan he is proud to be a soldier's son.